Welcome to our Kyusho Jitsu Workbooks in English. These are eBook specifically written for someone who is actively training in Kyusho Jitsu as a reference book. They are no stand alone teachings as our other series of books are! The first is our Novice Kyusho Jitsu Certification Workbook which is designed to help you from total beginner to the rank of 1st Dan Black Belt. The Advanced Kyusho Jitsu Certification Workbook is for anyone working for 2nd and 3rd Dan Black Belt. The Master's Kyusho Jitsu Certification Workbook is for 4th Dan Black Belt and over. More information on each book is below. In my first book I have organized the first year of Kyusho study, up to the rank of 1st Dan Black belt in such a way as to supplement your study with enough information to make the process much, much easier then it would be alone. Now I know there are other great books our there on pressure points. But honestly i find they jump around a lot and thus the information is very hard to internalize! My novice book is over 100 pages of information and diagrams to help you achieve your goals of being able to use pressure points in your current martial art style without changing what you are doing in that style! The book comes in PDF format and is also printable for you so you can take notes easily as you are learning! 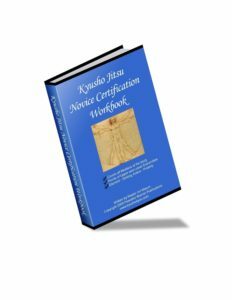 This is the ultimate resource for the advanced Kyusho practitioner! Designed for 1st Dan to 3rd Dan students cover everything from Alarm Points to Advanced Principles of Kyusho. This is also a printable manual but contains active links to support videos to help you remember and learn! This is a must have for all pressure point students who have had a year or so of training in the art. Like the novice eBook it is organized into easy study stages for ultimate learning and retention! This is the ultimate guide for any martial artist who wishes to be a true master of Kyusho Jitsu. However I will warn you, it is NOT for beginners! You need a solid working knowledge of the basics and much of the advanced techniques also! I strongly suggest reading the first 2 book before purchases this one. Much of this information is not known in the Kyusho world. It comes from many year, and a lot of investment in time and money learning this amazing art from the best in the world! This book includes so much information it will take you a long time to assimilate it! There are so some video links to help with certain concepts in this book. This is a NEW and REVISED EDITION for 2016! All languages available for other eBooks will be found on the English Page version of the book. Please fill out the form below with your name and email address. After this you MUST confirm your email address as this is required by law to give me permission to send you the eBook. All language version will be sent after confirmation. I hope you find this eBook of GREAT value to you!